I am currently a Project Manager and mostly work on web related projects: websites, intranets, web advertising and usability projects at the Portuguese Telecom. This year I decided to take 1 year off work to learn new approaches and to gain insight. Since 1995 I’ve worked on all sorts of web related projects. I started as a Communication Designer (BA at IADE, Lisbon) and then learned HTMl and moved to webdesign. In 2001 I started working as a Project Manager and in 2006 I became a certified Project Manager by the PMI. Besides Project Management I also like Design and whenever I find the time I like to do illustrations and photography. There were a lot of interactive experiences during the PICNIC, the virtual sightseeing scenic viewer by Ydreams was one of them. 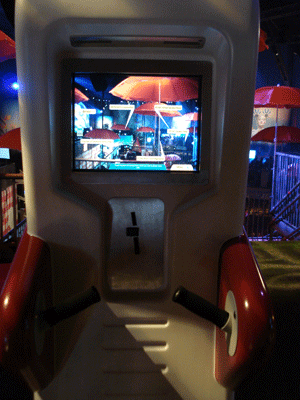 Even though this unit at a first look resembles like a kiosk, when you start swinging its screen to get a closer picture of the surronding landscape, you get an augmented reality with superimposed information over points pf interest. Watch the Ydreams R&D director explaining how it works. 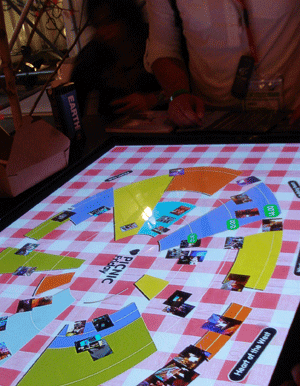 Another interactive experience was the Multitouch table brought by Iconomical and Studio Sophisti. This table aggregated photographs and blog entries and displayed them in a time line fashion. On this video you can watch a demo of how it works.